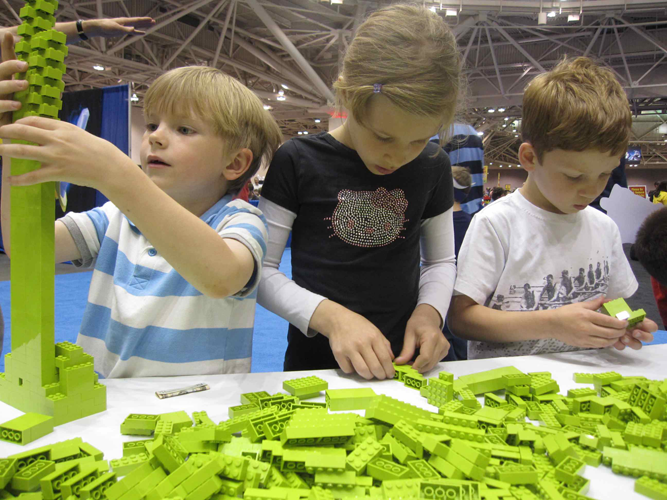 We were among the last attending Legofest in Minneapolis on Sunday. Team Lego was still going strong after three days and we (me, my daughter and son and my son’s friend) were lucky enough to see the beginnings of some towering Lego structures and weekend-long group activities, including Creation Nation, come to fruition. The weekend show had five shifts – Friday night 4:00-9:00p.m, Saturday and Sunday 9:00a.m. to 2:00p.m and 3:00p.m. to 8:00p.m. I suspected our shift was probably the least popular time slot, judging from the 50-plus lines of roped stanchions that were empty when we arrived at 4:15p.m. There would be plenty to see. Our first step was a visit to the Model Museum. Darth, C3PO and R2D2 were our favorites. It might have been named the Parent Photo Opp Center. Next was making and racing cars at the Race Ramps. They had done this (on a smaller-scale) at the Mall of America location, so they pushed their usual car creation to include wings and wheels on the top of the car, in case it flipped. 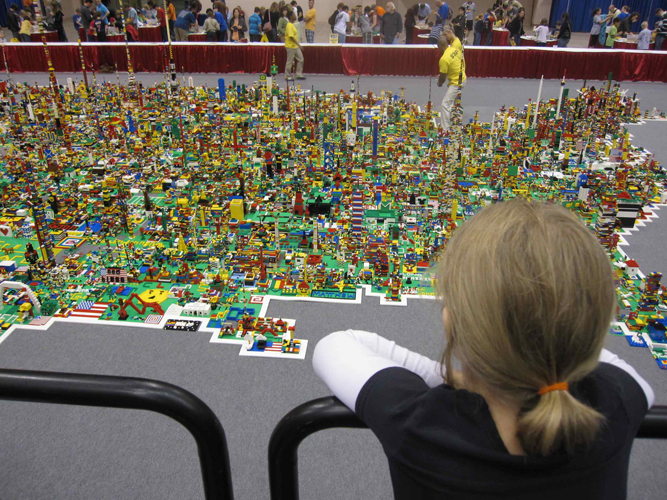 We then headed to Creation Nation – a huge map of the U.S outlined by white Legos, surrounded by tables and Lego staff that would strategically place your 16×16 Lego count green square where most appropriate. We contributed a modern house and a garden that strangely enough ended up in Kansas. We spent some time at the overview each pointing out special structures – The Statue of Liberty and what looked like the White House in Texas next to a prison. We couldn’t really see Minnesota from our viewpoint. There were several Monochrome Bricklayer areas set up. We spent 20 minutes or so at the lime green station and added our creations to the cityscape going up. It was 5:15. We headed over to the Lego Mystery Murial wall, but they were so distracted by the two adjoining Lego stores and the $20 to spend at their discretion, we turned our focus to shopping. After paying for parking and tickets – $20 for parents and $18 for kids (2 and under are free) – parents were also buying Legos. When we entered the store, we could browse at our leisure. After 5 minutes, I looked up and wondered why the mad rush? It was time to make our choices, pay and get out. After settling on a few items in our price range, we moved through the line quickly due to at least ten checkouts. With the anxiety of what to get behind us, we moved on to the football toss with the Vikings (the Lynx were there as well) and bypassed the long line for the jump bubble – both of which they could do anywhere. We then came across Brickscapes Model Mash-ups, a mix of all different Lego series behind a glass cube and questions prompting kids to find where certain Legos where – sharks, dogs, etc – in the mashed-up cityscape. It was 6:15. We were at the two-hour mark. We still had not visited the Games area (Lego Creationary tables set up seemed very popular) nor the Universe videogame area, nor the Lost Parents area. I was fine with all of this. Calvin’s friend was ready to go too, a new StarWars Lego battleship in hand. We arrived home around 7:00 with some take-out that was downed with lightning speed. What? Why? 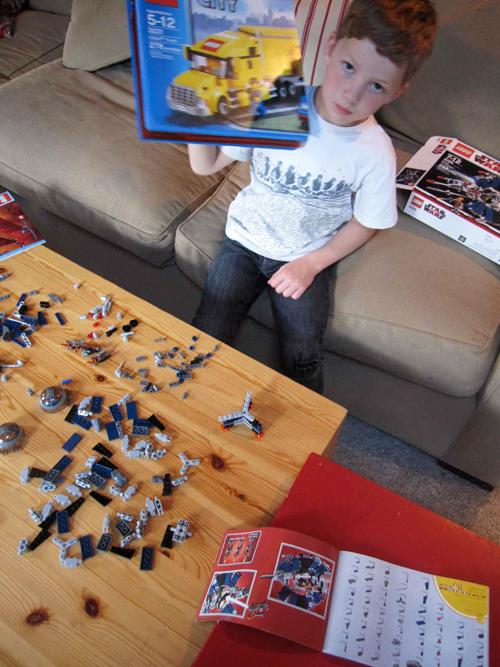 Oh yeah, the new StarWars Lego Droid Tri-Fighter with 268 pieces awaited. Now Calvin could neatly organize it in our newly created three-ring binder with sleeves to hold each project’s box cover and instruction book. Now if we could just keep the foot-piercing Legos in their place. At the end of the day, Legos categorized away, a thought I’m pondering: No doubt they are a great toy that people of all ages can enjoy, but contributing to all of that plastic production? Yikes! I’ll leave you with Lego’s call out in their brochure: Did you know that Lego minifigures are the world’s largest population? 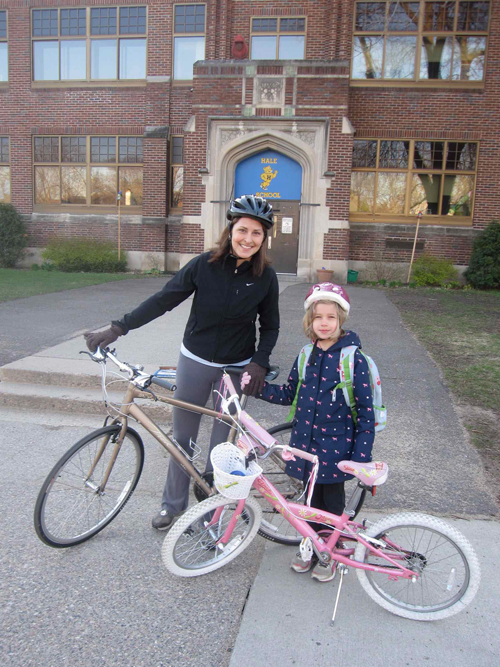 A few weeks back, on a cold, blustery May morning, we began our commitment of one week of biking from our home to my daughter’s school, Hale Elementary in Minneapolis. Around the world, loads of other schools were joining in on the fun too as part of International Walk and Bike to School Week. Our city is a bike-friendly city. Minneapolis ranked second in a recent study that took into account major American cities with 4.3% or 8,200 of us biking to work. These numbers are much higher elsewhere in the world. Try YouTubing winter bike riding in Amsterdam or Utrecht, Netherlands, for example, and you’ll see these European bikers are not phased by the weather as they pedal through the slush and move smoothly with traffic. Now I know there are Minnesotans who bike in the winter with very little to stop them (4,000 of those 8,200 mentioned earlier continue riding in the winter), but they are in the minority against vehicles. I notice the bikers in Amsterdam seem to outnumber vehicles, attributing a bit to their more leisurely posture, go-to-market bike vs the racing bike and that their biking attire might also be exactly what they wear to work for the day. The week would be a test of how bike-friendly our city is and how biking to school (potentially work) fits within our lifestyle. Day one: As we set out on that first Monday morning, my 7-yr-old, Ava, wandered in and out of the sidewalks and streets at this leisurely pace that I envied. I will try to stop coaxing her to go faster, I promised. The sun was present with fleeting snow flurries as we neared her school. We were one of the first to arrive by bike and we had our first choice of docking station at the bike rack. Today was a practice ride for Wednesday – Friday of week, when I had volunteered to be sticker mom from 7:00 – 7:30 on the corner. Day two: We awoke to sunshine (still very brisk though). Ava loves that we’re not rushing to catch the bus. We can leave whenever we’re ready, within reason. The commute is 7 long and 6 short city blocks. It takes about 14 minutes, but who’s counting. 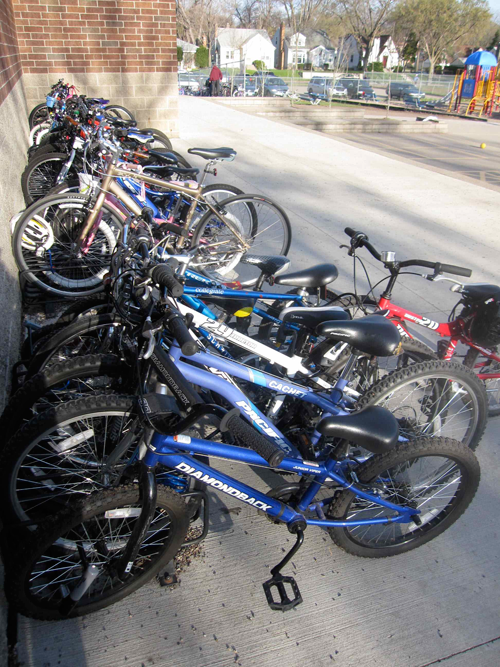 The bikes line the racks and the fences surrounding the schools. I know someone on our Hale Wellness Committee is in charge of coffee from Sister Sledge, but I don’t have time to indulge. I need to bike it back home to get showered and changed (this is not Amsterdam!) and prod my 5-yr-old, Calvin, out the door to school, then get myself to work. All before 8:00. Day three: The wind is trying to sabotage us. We are still biking, Mother Nature. People do this all winter. No excuses I tell Ava. She’s a gamer. Biking and weaving along behind me, her little bell bbbrrr–ringing at every crack in the sidewalk. This is a sticker day for me so Ava and I pick up stickers and head it to one of the corners. We greet each walker/biker kid with a Good Morning and Congratulations on your carbon-free choice to get to school today. We slap a sticker on everyone and send them on their way. Day four: Rain. At least the wind has relented. We debate about rigging umbrellas to our backpacks and decide against it. It’s not a heavy rain, just consistent and wet. Our rain gear holds for the short ride and Ava beelines in for school breakfast, leaving me to be solo stickerer on the corner. Finally day five. An added challenge: my 5-yr-old is coming with. Calvin does a stellar job keeping up and showed no signs of fatigue (until later in the day he takes an unprecedented midday nap with the 3 & 4 yr-olds at his school). He and Ava play on the playground while I sticker kids. There are some families/kids that walk/ride most days of the year; others committing to the full home to school route while others park 2-3 blocks away and walk their kids in. Ava called them cheaters, but I explain that we have to kind of let that fly. We are, after all, only half-way committed ourselves because I pick her up after school and throw her bike on the bike rack on my car. And I forgot to mention the weather, but it actually cooperated this day. Bike/Walk Week proved to be a good challenge. I can think of three goals. 1. It allows kids to think about alternative transportation. My kids asked the following week why couldn’t we always bike to school, the grocery store and even church? Just last night, we biked to our nearby park for my son’s T-ball game. We had so much fun doing that, but I’ll have you know it was prompted because we didn’t have access to a car at the time. 2. Obviously, the purpose of the week is also to get some activity and encourage activity as part of a daily routine. We definitely did. 3. And lastly, we’d have so many kids would participate in the week that they’d stop running the buses, achieving a higher sustainability goal. We estimated that about 100 kids biked each day (based on a bike count) and similar numbers walked it in for 200 total in a 600-kid school. That’s 33%, Hollanders! 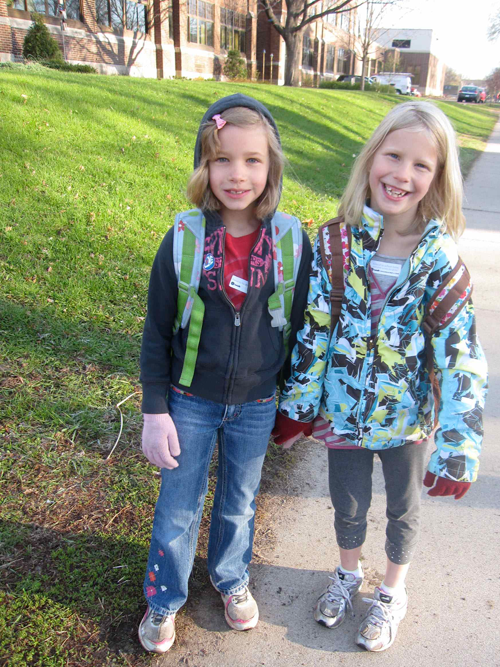 We thought the commute was safe, easy and fun (if not chilly) as a way to get to school. I wondered about biking to work…. how feasible would that be? If we can just get employers to add showers at work or collectively relax corporate America dress code, we might eliminate a few more barriers to a bike-friendly society for workers/ lifestyle (not just biking for a workout). That could make for a Nice Ride. Even on the first sunny 71 degree Saturday in 7 months we did not want to miss the Walker Art Center’s first Saturday of the month, complete with free admission and family-oriented programming. The assumption may be that museums are an inside thing. The great thing about the Walker, as we rediscovered today, was that it offers both indoor and outdoor inspiration. Chris Larson’s piece in particular literally straddles the interior and exterior. 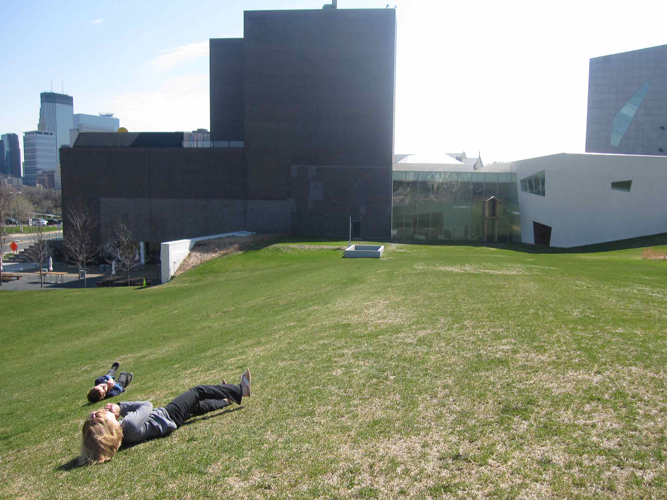 Then there’s the sculpture garden and Open Field (their FB says 31 days left til its open). Typically we park underground to stay out of the elements, but today we parked on the hill above Open Field. The temptation was too great to resist rolling down the hill, plus they had it all to themselves. After rolling down, there’s running up and repeat, then just running down screaming at the top of your lungs. We head indoors and check out the Happy Duckling film, a sweet short film in pop-up book style about a mother and son (co-operators of the Happy Duckling Restaurant) and a persistent duck whose persistence doesn’t pay off. By the way kids are always crawling over the “seats” of random height and width in this film area, you’d think it was a jungle gym. On to more activity. The busiest area on a Saturday is usually the Star Tribune Foundation Art Lab, so we head there first at 10:30. 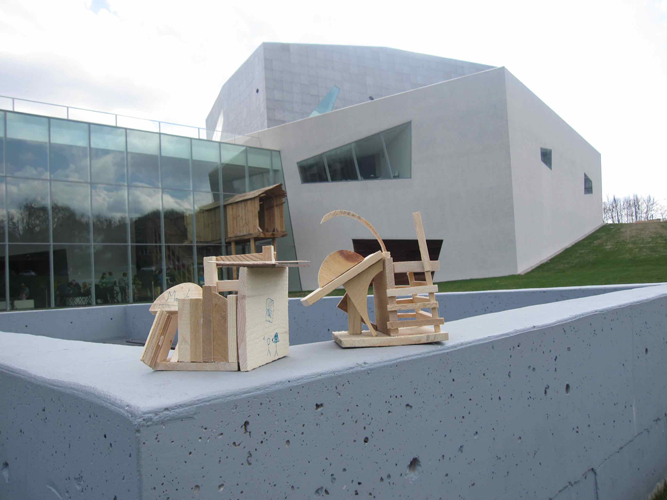 We select a mix of small wood pieces and are to use the artist’s structure (installation) as inspiration for our structures. It had been three months since we actually walked through the structure in the Cargill Lounge so we tried to recollect. Before going crazy with the cordless hot glue guns, I encouraged them to look at the picture of the structure and come up with their own vision. My 5-yr-old opted for a dual chicken coop and horse stable, while my 7-yr-old opted for a Menard’s store (influences from her Papa) with the paparazzi taking photos outside of it (influences from?). WAC Pack Check. Midnight Party Next? Chris Larson, the artist, is actually there. He checks in with all of the junior builders and offers advice and asks a few questions. We spend about 30 minutes assembling the structure and move them to the shelf to set. 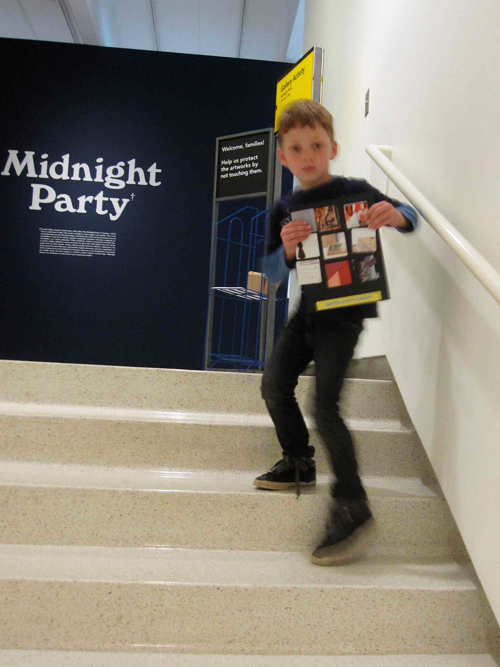 Then we head to the lobby desk where there are three different WAC packs for kids – we select the “Explorer” and set out to find 9 works of art in galleries 1-3. It’s a matching task – a 2×2″ magnet zoomed-in on artwork that needs to be matched with the artwork itself. I thought this would be a difficult task, but they found seven somewhat easily and we retraced our steps a bit to find the last two. 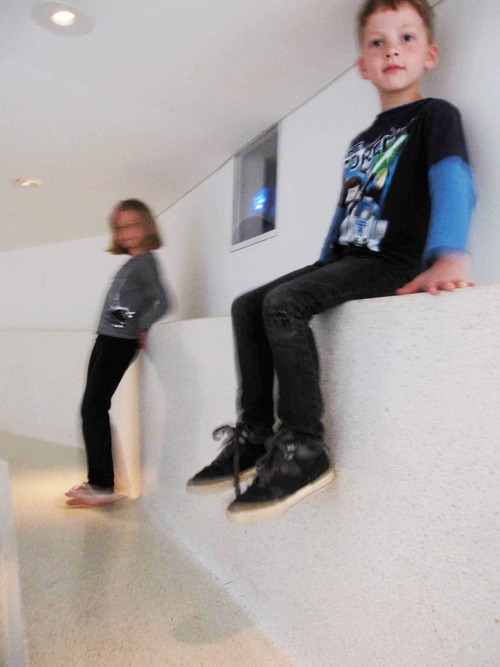 We cruised through Larson’s installation again (see the video), the kids noting the illusion of continuity from inside to out and the staircase that led nowhere (see here from a previous outing). Then we wandered through the Walker Art Shop, the Spectacular of Vernacular (ends May 8), and grabbed a snack at the Garden Cafe before swinging by to pick up our structures. We considered the 7th Floor Jewelry Mart that was special in the line-up today, but kids were too hungry to delay snack-time. We enjoyed sitting outside for snacks and the kids got in a few more trips down the hill before rolling out around 12:30 or so. I was reminded by a few staffers that they’ll be taking activities outside for the summer. If you haven’t taken your kids, it’s a great family-friendly outing. Next one: June 4. Who knows, maybe even parents will be inspired enough to take a Spring roll down the hill. The rites and rituals of religion work in strange and fascinating ways. As my 7-yr-old, Ava, received the sacrament of First Communion today, we experienced the pomp and circumstance of the whole affair. 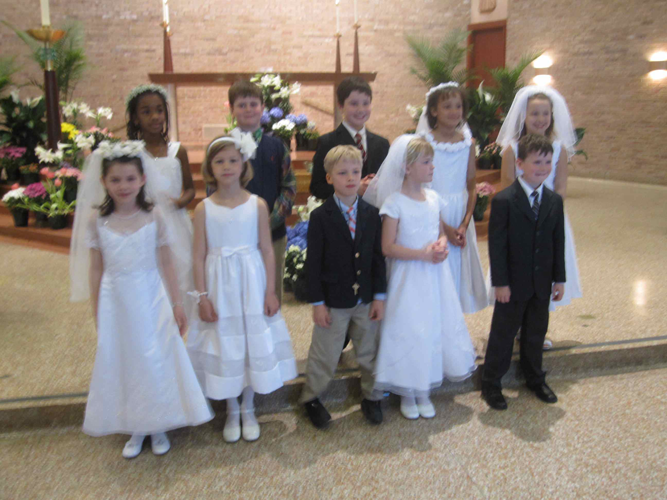 From the white dresses and pinstriped suits to veils and crosses and turning all eyes of the congregation on them, every one of these children felt something special was about to happen. Their group of ten got the red carpet treatment in their preparation for this day and during the day itself. The children sat nearest the center aisle with their family filling the pew beside them. The priest came nearer to them for the homily and delivered it in their language, translating “go forth with grace” to something more akin to “be nice to people in school, on the playground and at home.” When they were asked to come in front of the church for a blessing, in ritualistic Catholic form, we all extended our right arm out to hover there for extended prayers. I remember feeling a little unsure when I first received communion in second grade. Our current church prepared them well – they even got to taste the unconsecrated body and blood prior to the big day, just to alleviate questions and explain how to consume the host and not tip the cup too rapidly and douse your white dress. All actions which would now become weekly rituals for her that symbolize she is more grown-up and responsible for her actions. 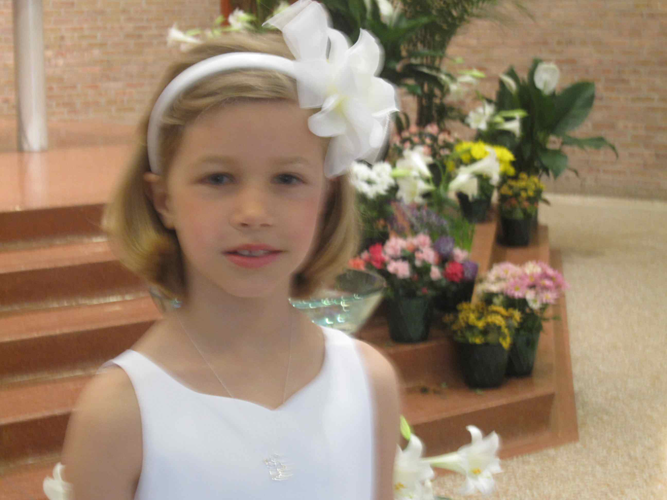 I remember her saying to me one afternoon last month, “Things are really getting serious now.” She was referring to her pending first communion, taking on the science fair and graduating from second grade. Silence kind of lingered. There wasn’t sadness or excitement in her voice, rather just a statement. Today there was supposed to be a statement by her in the form of “Amen,” or I believe, when presented with the host. A confidence, acceptance and conviction needed to be conveyed like we practiced. She bowed, took her correctly positioned right hand out from under her left and reached to move the host into her mouth. Believe me I watched from beside not behind her and I cannot say that I saw her lips move with that phrase. I believe her later when she says she did. She side-stepped to the blood of Christ, still consuming the host. She stood there quite a while, taking her time. I nudged her to give encouragement that this should happen now. It happened. It’s official. The priest crowned them duchesses and dukes of the church. We gather for a little reception there then head back with family to our house for brunch and celebration. Gifts are first (thank you Apostle Books and Gifts in Minnetonka). She thoughtfully reads each card and considers each gift. 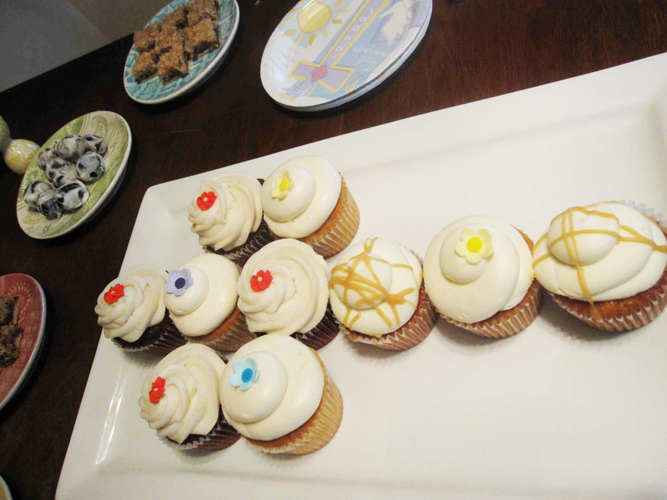 Then comes the ritualistic food: ham sandwiches, deviled eggs (by 5-yr-old Calvin), and cake, er, cupcakes (by Sweet Retreat). During brunch, Ava’s brother, Calvin, who I thought was a bit uninterested all day due to some subtle body language I was picking up on, was paying attention after all. Before anyone knew what he was up to, he grabbed the crystal candy dish filled with jelly beans and preceded to present them to the party guests as the body of Christ. Some devout Catholics in the group were waivering on what to do, but I think the seriousness with which he approached the task ensured their consumption. After all of the circumstance, for some, there was another ritual – – a Sunday nap. Albeit naps were cut short for Ava’s Spring dance performance. A big day for her no doubt. As we were getting ready to turn in for the night, Ava and I smiled to overhear Calvin in his room to the tune of “Glory to God in the Highest and Peace to his People on Earth…,” in his version, “Morning to God in the Highest…” And while we do a lot of questioning of rituals in this household, this song from him sounded so sweet and reminded me that out of ritual comes discovery, comfort and peace.